Limb-girdle muscular dystrophies (LGMDs) are heterogeneous disorders comprising many subtypes having phenotypic overlap. Definitive diagnosis relies on molecular methods and immune assays for specific proteins. Sensitivity and specificity of tests used for qualitative or quantitative determination of sarcolemmal proteins have limitations. , Demonstration of pathogenic mutations is considered to be confirmative , but is a formidable task, given the large number of genes involved in LGMDs and the multitude of pathogenic alleles in individual genes. Yield and impact of analysis of founder mutations in the Agarwals presenting with LGMD phenotype is as yet undetermined. This study was undertaken to evaluate these aspects. This observational study was conducted from January 2010 to April 2015 and was approved by the institutional review board. Patients from the Agarwal community. LGMD phenotype, raised creatine kinase (CK), and electromyography suggestive of myopathy. First-degree relatives of patients with genetically confirmed mutation desirous of counseling. Muscular dystrophies other than LGMD (Duchenne muscular dystrophy, Becker muscular dystrophy, myotonic dystrophy, fascioscapulohumeral dystrophy, congenital muscular dystrophy, etc.). Neurogenic disorders based on detailed neurological examination and electrophysiological studies. Participants not consenting for the study. Age of onset and symptoms were documented and pedigree charts were prepared. Detailed muscle power charting was performed by manual muscle testing scale. Particular attention was given to scapular winging, abdominal hernia, and Achilles tendon contractures. Examination of sensory system and reflexes was performed. Family members were examined when possible. "Agarwal founder mutations" (intron 18/exon 19 c.2051-1G>T and exon 22 c.2338 G>C) studies were conducted. 2 mL of blood sample from each patient was collected in ethylenediamine tetraacetic acid (EDTA) tube. DNA was extracted by Qiagen Blood mini kit, Germany (as per protocol provided). Polymerase chain reaction (PCR) amplification was performed for exons 19 and 22 of CAPN3 gene followed by Sanger sequencing [Figure 1]a and b. 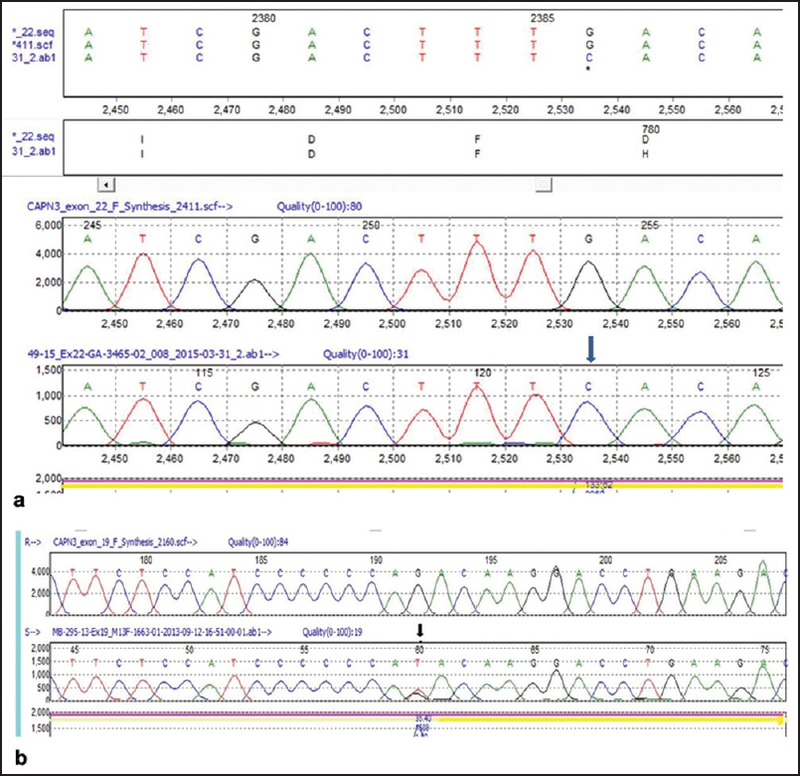 The patient's sequences were then aligned to wild type reference sequences using mutation surveyor alignment software (Softgenetics, Inc., USA) for mutation detection. Symptomatic individuals testing negative for the mutations were studied further. Monocyte assay/ western blot to detect the expression of dysferlin protein for LGMD2B (funded by Jain Foundation USA, India project) followed by available genetic evaluation as applicable was performed. 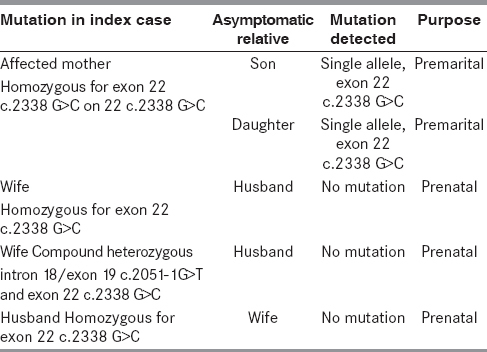 Thirty-four subjects fulfilled inclusion criteria (29 LGMD patients and 5 asymptomatic relatives of index cases with known mutation in the founder alleles). There were 13 males and 21 females. Age at presentation ranged 18-48 years and the onset of the symptoms was between 11 years and 30 years. The most common phenotype was the pelvifemoral type (24/29) followed by scapuloheumeral type (5/29). 21/29 patients had scapular winging [Figure 2]a, 25/29 had Achilles tendon contractures [Figure 2]b, and abdominal herniae were seen in two patients. Average CK value was 3430. Founder alleles were detected in 26 out of 29 index cases, resulting in a sensitivity of 89% [Table 1]. The most common genotype observed was homozygous state for exon 22 c.2338 G>C mutation followed by compound heterozygosity. Single founder allele was identified in two patients. In two of the three index cases who did not show the founder mutation in CAPN3 gene, monocyte western blot assay showed absent dysferlin protein and on further evaluation, using new generation sequencing for LGMD panel showed homozygous mutation in the dysferlin gene (c.5713 C>T), confirming LGMD2B in these two siblings. In the remaining single index case, molecular diagnosis could not be reached. Five asymptomatic relatives sought help for the founder allele analysis. Among them, two were offsprings of an affected homozygous mother planning marriage and the remaining three were spouses of index cases having mutation in founder alleles [Table 2]. In the Agarwals presenting with LGMD phenotype, the frequency of finding founder alleles was very high (89%). This high frequency of detection underscores two important facts. First, LGMD2A is the most frequent LGMD in the Agarwals and second, it is a result of mutations in the two founder alleles. Hence, studying these two alleles can give substantial detection rates. Thus, the present study demonstrates the utility of private mutation analysis in the Agarwals. Only three out of 29 patients did not have mutations in the founder alleles. Two of these, on further investigations were detected to have mutations in the dysferlin gene (c.5713 C>T) and in one, molecular diagnosis was not achieved. The present study did not find a predilection toward any of the gotras. Allele-specific genetic testing is an important tool for the detection of preclinical stage of the disease, carrier detection, and offering genetic counseling. ,, In the Agarwals who practice intracommunal exogamy, carrier detection is important for premarital planning and prenatal planning. As demonstrated in [Table 2], offsprings of a homozygous index case were obligate carriers and hence, premarital testing of their partners was advised to avoid transmission to the next generation. Similarly, three spouses of index cases undertook prenatal testing, the normal genotypes in the spouse making the probability of having diseased offspring negligible. Thus, the founder allele evaluation helped carrier detection and counseling in this study. LGMD2A forms a majority of LGMDs in the Agarwals. The present investigation establishes the high sensitivity (89%) of two founder alleles in the calpain gene in the Agarwals having LGMD phenotype. This information is productive for diagnosis, carrier detection, and counseling, offering community benefits at multiple levels. Testing the founder mutations can be used as the first diagnostic test, bypassing the muscle biopsy in the Agarwals having LGMDs. We acknowledge Jain Foundation USA, India project for funding the dysferlin protein analysis of two patients. Angelini C, Fanin M. Calpainopathy. 2005 May 10. In: Pagon RA, Adam MP, Ardinger HH, Wallace SE, Amemiya A, Bean LJH, et al., editors. GeneReviews ® [Internet]. Seattle (WA): University of Washington, Seattle; 1993-2015. Available from: http://www.ncbi.nlm.nih.gov/books/NBK1313/. [Last accessed on 2014 Nov 26]. Fanin M, Fulizio L, Nascimbeni AC, Spinazzi M, Piluso G, Ventriglia VM, et al. Molecular diagnosis in LGMD2A: Mutation analysis or protein testing? Hum Mutat 2004;24:52-62. Bushby KM. Making sense of the limb-girdle muscular dystrophies. Brain 1999;122:1403-20. Urtizberea JA, Leturcq F. Limb girdle muscular dystrophies: The clinicopathological viewpoint. Ann Indian Acad Neurol 2007;10:214-24. Fanin M, Angelini C. Protein and genetic diagnosis of limb girdle muscular dystrophy type 2a: The yield and the pitfalls. Muscle Nerve 2015;52:163-73. Fanin M, Nascimbeni AC, Tasca E, Angelini C. Hum How to tackle the diagnosis of limb-girdle muscular dystrophy 2A. Eur J Genet 2009;17:598-603.
de Paula F, Vainzof M, Passos-Bueno MR, de Cássia M Pavanello R, Matioli SR, V B Anderson L, et al. Clinical variability in calpainopathy: What makes the difference? Eur J Hum Genet 2002;10:825-32. Hanisch F, Müller CR, Grimm D, Xue L, Traufeller K, Merkenschlager A, et al. Frequency of calpain-3 c.550delA mutation in limb girdle muscular dystrophy type 2 and isolated hyperCKemia in German patients. Clin Neuropathol 2007;26:157-63. Ankala A, Kohn JN, Dastur R, Gaitonde P, Khadilkar SV, Hegde MR. Ancestral founder mutations in calpain-3 in the Indian Agarwal community: Historical, clinical, and molecular perspective. Muscle Nerve 2013;47:931-7. Singhal BS, Gursahani RD, Udani VP, Biniwale AA. Megalencephalic leukodystrophy in an Asian Indian ethnic group. Pediatr Neurol 1996 14:291-6. Sinha KK. Spinocerebellar ataxia 12 (SCA12). A tremor dominant disease, typically seen in India. In: Medicine Update 2005. Mumbai, India: Association of Physicians of India; 2005. p. 600-2. Kendall FP, McCreary EK, Provance PG. Muscles: Testing and Function. Baltimore, MD: Williams & Wilkins; 1993. p. 185. Aminoff MJ. Aminoffs Electrodiagnosis in Clinical Neurology. 6 th ed. San Fransisco: Elsevier; 2012. p. 233-56. Fardeau M, Hillaire D, Mignard C, Feingold N, Feingold J, Mignard D, et al. Juvenile limb girdle muscular dystrophy. Clinical, histopathological and genetic data from a small community living in the Reunion Island. Brain 1996;119:295-308. Fanin M, Benedicenti F, Fritegotto C, Nascimbeni AC, Peterle E, Stanzial F, et al. An intronic mutation causes severe LGMD2A in a large inbred family belonging to a genetic isolate in the Alps. Clin Genet 2012;82:601-2. Pogoda TV, Krakhmaleva IN, Lipatova NA, Shakhovskaya NI, Shishkin SS, Limborska SA. High incidence of 550delA mutation of CAPN3 in LGMD2A from Russia. Hum Mutat 2000;15:295. Milic A, Canki-Klain N. Calpainopathy (LGMD2A) in Croatia: Molecular and haplotype analysis. Croat Med J 2005;46:657-63. Todorova A, Georgieva B, Tournev I, Todorov T, Bogdanova N, Mitev V, et al. A large deletion and novel point mutations in the calpain-3 gene (CAPN3) in Bulgarian LGMD2A patients. Neurogenetics 2007;8:225-9. Fanin M, Nascimbeni AC, Fulizio L, Angelini C. The frequency of limb girdle muscular dystrophy 2A in northeastern Italy. Neuromuscul Disord 2005;15:218-24. Young K, Foroud T, Williams P, Jackson CE, Beckmann JS, Cohen D, et al. Confirmation of linkage of limb-girdle muscular dystrophy type 2 to chromosome 15. Genomics 1992;13:1370-1. Richard I, Broux O, Allamand V, Fougerousse F, Chiannilkulchai N, Bourg N, et al. Mutations in the proteolytic enzyme calpain-3 cause limb girdle muscular dystrophy type 2A. Cell 1995;81:27-40. Urtasun M, Saenz A, Roudaut C, Poza JJ, Urtizberea JA, Cobo AM, et al. Limb-girdle muscular dystrophy in Guipuzcoa (Basque Country, Spain). Brain 1998;121:1735-47. Cobo AM, Sáenz A, Poza JJ, Urtasun M, Indakoetxea B, Urtizberea JA, et al. A common haplotype associated with the Basque 2362AG>TCATCT mutation in the muscular calpain-3 gene. Hum Biol 2004;76:731-41.